Our Registered Midwives (RM) provide attentive primary care to healthy pregnant women and their newborn babies from early pregnancy, through labour and birth, and up to six weeks postpartum. We offer delivery options at Langley Memorial or Surrey Memorial Hospital, or a home birth setting. We are here for our patients and would be happy to orient you to our abilities and experience. If you wish to receive more information regarding our services, please contact us at 604-534-9121. We look forward to serving you and your family with your health care needs. See six Guiding Principles of Naturopathic Medicine. See our Specialized Diagnostic Testing available at the Family Health Clinic. We find there are often three different reasons why people seek the help of Naturopathic Doctors: 1) they have an ongoing condition but have not found relief with any treatment tried thus far; 2) they have been diagnosed with an illness and are looking for alternative treatments; 3) they are interested in disease prevention and health promotion strategies because they recognize that good health just doesn't happen by chance. See our list of Commonly Treated Conditions. In British Columbia (BC) Registered Midwives offer primary care to low risk expectant mothers from the early stages of pregnancy through to delivery and for six weeks postpartum. Midwifery services in BC are paid for by the Medical Services Plan so that women who desire a more "natural" childbirth experience are able to avail themselves with these properly trained and licensed health care providers. 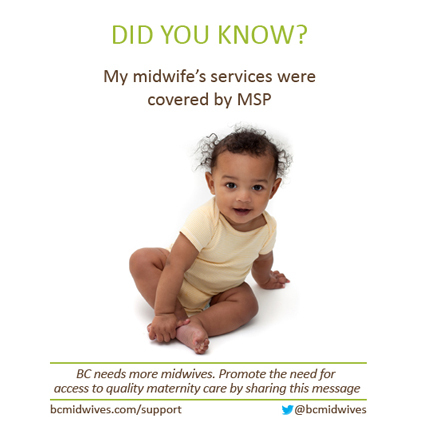 Midwives are involved in over 16% of pregnancies and births in BC.